With the police getting closer to the truth, Kelly is afraid they’re onto her in Holby’s first real-time episode, which begins at 8pm on a Tuesday evening in the hospital. As Kelly prepares to leave Holby for good, Nic catches up with her and tries to convince her to stay. She gives him an ultimatum: come with her or say goodbye. Nic is worried and decides to cancel his plans to see Jess. 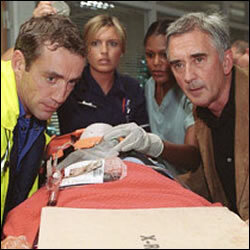 As the brother and sister speed away from the hospital, Kelly tries to justify her actions to Nic. She tearfully confesses the abuse she endured at the hands of their father and talks about how her mother later abandoned her. Elsewhere, Ed returns to the hospital with a victim of a road traffic accident in time to see Tom Campbell Gore racing through the corridors. There’s no time to contemplate the surgeon’s return, but it’s hard for Tom to re-adjust to the shift in power. * This episode was filmed in ‘real time’ – an hour of Holby at 8pm 2nd December.